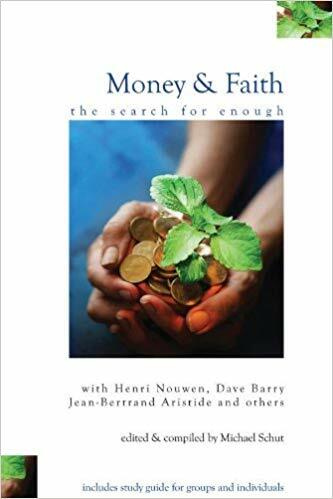 Money and Faith, a seemingly taboo topic for discussion in today’s society. The author, Michael Schut, finds this odd seeing as how the Bible discusses finances, wealth, and faith and how Jesus addressed these such things often. Part 1, Section 1 - Abundance and Scarcity- How Do You See? The topic of abundance and scarcity when being addressed in the context of the church promote the idea that the world has caused us to constantly be in a “we need more” mentality when the Lord has already abundantly blessed us, yet still we are not satisfied and constantly worried about the scarcity of not having enough money. Part 1, Section 2 - Demystifying Money- What is the Stuff Anyway? In society, we place so much value on money. Yes, there is monetary value when it comes to money but I am talking about a different kind of value. As a society, we are beginning to place hope and trust in money and more often than not our happiness is wrapped up in our bank account. This is not just becoming a stark truth for society but for the church as well. When it comes down to it, money is just a piece of paper so why is there this value placed on money that isn’t actually there? As Christians, we need to be “demystifying” money and finding our value in God’s economy versus the scarcity, abundance, and value our society stresses. Part 1, Section 3 - What is Compassion's Call? Compassions means “to suffer with.” There are two necessary steps talk about when referring to compassion: empathy and justice. Compassion brings joy, consists of mutual giving and receiving and calls us to “downward mobility.” When we allow the Lord to be in total control and we have a giving mindset, it allows us for deeper connection with people and the opportunity to be the church to those in need. Within this section, the authors address the story of the rich man and the verse stating “How difficult it will be for those with riches to enter the Kingdom of God!” In this story, Jesus is not inviting the rich man to change his attitude toward his wealth, nor treat his servants better, nor to reform his personal life. He is asserting the precondition for discipleship: economic justice. The Lord wants us to be able to be the church to people, and part of being the church is having economic responsibilities. When we release control of our money, the Lord has so much to work with and is able to open those doors for discipleship. It allows us to be compassionate and have a giving heart. Part 2, Section 1- Is More Money Better? When it comes to money we all need financial advisors and economic experts but we also need pastors and spiritual leaders to question the greed in the economy. Today’s global economic system does not see itself as rooted and wholly dependent on the larger world, Earth’s economy. The Earth’s economy revolves around local resources. Neoclassic economics assume the unquestionable importance of the individual and his or her desire. There is an argument that more is better that floats around in our society not only in conjunction with money. He argues that growth is no longer making most people wealthier, but instead generating inequality and insecurity. Secondly, constant growth is profoundly colliding with ecological limits such that our planet’s ability to sustain growth may not be possible. Lastly, research supports what many of us feel intuitively more, growth, greater wealth is not making us happier. Traditionally happiness and satisfaction have been linked to economic growth. Economists call this utility maximization. This theory holds that every time a person buys something, sells something, quits a job, or invests, he is making a rational decision about what will provide one with maximized utility. However, this satisfaction is merely temporary. Researchers report that money consistently buys happiness right up to $10,000 per capita incomes, and after than point the correlation disappears. The ecological economics begins with human needs, the need for a productive and permanent dwelling in which to live. We must maintain the health of the planet that gives us everything we need to live. Part 2, Section 2 - Corporations Are People Too? Thorn Hartmann details how corporations gained the legal status of persons in an 1886 Supreme Court case titled Santa Clara County vs. Southern Pacific Railroad Company. This was a simple tax case that resulted in ratification of the fourteenth amendment. The railroad company’s attorneys insisted that the company should be entitled to human rights under the amendment. Corporate person has certain advantages over most actual persons. They can operate/exist in more than one place at a time, they have millions even billions of dollars at their disposals, they do not heed to the guidance of a conscience, and they are potentially immortal. For small, local businesses and actual persons they have a harder time standing up against big corporations because they don’t have nearly the same resources at their disposal. When corporations challenge average people they don’t stand a chance in defending themselves. That is why it is so important to support local businesses. Corporations are uniquely powerful and use their advantages to become even more powerful. Part 2, Section 3 - Whose Voices are Rarely Heard? To experience liberation from an oppressive economic system we need to listen and respond to the voice of those oppressed. An essay explores the damage of free trade on poor countries. They use Haiti as an example and how US subsidiaries on rice destroyed the rice market in Haiti, the number one staple food item for the country. The poor Haitian farmers could not compete with the cheap prices the US offered because they sold in bulk. Globalization is obviously a must in today’s economy but there also comes a point to where the voices on the oppressed but be recognized. Part 2, Section 4 - What is the Jubilee? The Jubilee entails the notion of returning to God what is not ours in the first place. The Jubilee is a fundamental practice of justice. Leviticus 25 elaborates on what finding out and giving back entails. One point that the text makes clear is the time of ownership and because everything in the universe is a gift you are only allowed to buy so much. It also mentions that the first time Jubilee was proclaimed was in reference to “capital” or land. There are guidelines being developed in today’s world to determine what belongs to whom. (1) There are limits to growth. (2) There are limits to earnings. (3) There are limits to accumulation. (4) There are no limits to all people having the right to certain benefits. (5) There are also no limits to two others things- human resistance and human imagination. We are called to be a Jubilee church. The bible offers a double blessing of salvation and liberation that work in conjunction to develop our inner character. Acts is scriptural Jubilee text. The Jubilee was legislation, politics with a spiritual base. A just economic order was a way of life that cared for the poor and put restrictions on the rich. To be a Jubilee based church is a spiritually based political action, but it is also a spiritually based lifestyle. We are called to love one another and pour into each other. When we do this God will shower us with even greater signs and wonder. The message that Chapter 8 conveys is that practicing the Sabbath and Tithing are both necessary commands that the Lord gives to us. They are both ways of us saying, “God, You are in control, You will provide all I need, and You are enough.” For us to live in the way that God says will give us the most abundant life, we must make these disciples part of our lives in order to disconnect from the world we live in, and to connect with our Father in heaven. Our fallen world is trying to get us to focus on everything but God, so we must do everything we can to make him the center. Our time and money are two of the many things we must keep in check so that our relationship with God can be the healthiest possible. We must move beyond charitable giving and broaden our concepts of stewardship to include how we deposit, loan, and invest our money. We must invest ways that benefit and support others especially the poor. When and if we do retire (depending on a variety of circumstances) we should live out our retirement in a way that puts the Kingdom first. We should live with an “enough” attitude that is counter-cultural to the way society thinks about retirement. We must strive to maintain a level playing field between private corporations and organized commons. While at the same time trading within limits that benefit and keep in check both corporations and commons. We must rapidly reorient how we view the correlation between economy and ecosystem. The key to obtaining this balance is by having prices of goods that reflect and account for the consequences it has on the ecosystem.